We venture just to the west of London this week for a quick look at the five day horseracing event known as Royal Ascot which concludes tomorrow with the Diamond Jubilee Stakes, renamed to mark Queen Elizabeth II’s Diamond Jubilee. While Royal Ascot is now a highlight of the horse-racing calendar around the world (and all eyes this year on Frankel and Black Caviar), the origins of horse-racing at the 179 acre Ascot Racecourse, located at Ascot, adjacent to Windsor Great Park, go back some 300 years. The first race meeting was held here on 11th August, 1711 – it was apparently Queen Anne who first spotted the potential of the site, then known as East Cote, as a suitable location for a racecourse when out riding from Windsor Castle earlier that year, hence she is celebrated as the founder of the event (today, the Queen Anne Stakes is run in memory of Queen Anne’s vital contribution). The inaugural event was Her Majesty’s Plate, which carried a prize packet of 100 guineas. Seven horses, each carrying 12 stone of weight, took part in what were three separate heats, each four miles long, but there is apparently no record of who won. While the racecourse was laid out by William Lowen and his team on the orders of Queen Anne, the first permanent building, constructed by a Windsor builder, wasn’t erected until 1794 – capable of holding 1,650 people, it remained in use until 1838. Meanwhile, the future of the course, which stands on Crown property, was pretty much guaranteed in 1813 when an Act of Parliament ensured the area on which the course stands would remain in use as a public racecourse. It was the introduction of the Gold Cup in 1807 which is believed to have ushered in the race meet we now know. It remains the feature race of the third day of Royal Ascot which, known as Ladies Day, became the dominant day of the race meeting. In 1825, King George IV established the first Royal Procession, which still occurs on each day of the meeting and makes its way from the Golden Gates and along the racecourse and into the Parade Ring. 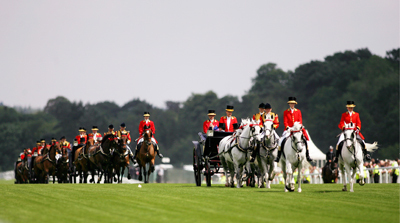 Up until 1901, the racecourse was run on behalf of the Sovereign by the Master of the Royal Buckhounds – an officer in the Royal Household. In that year the situation changed when Lord Churchill was appointed as His Majesty’s Representative and made responsible for running the course and entrance to the Royal Enclosure. In 1913, the Ascot Authority was established to handle the running of the racecourse and His Majesty’s Representative become the chairman of the new organisation. The chairman, who is currently Johnny Weatherby, remains at the head of Ascot Authority (Holdings) Limited today and is still referred to by the title Her Majesty’s Representative. In 2002, Ascot Racecourse Ltd was incorporated and is now the organisation responsible for running the racecourse – this underwent a £200 million redevelopment in the mid 2000s which included construction of the spectator stand, reopening in 2006 (pictured in the last picture is the Queen arriving at the reopening). Among the traditions associated with Royal Ascot is that the jockeys who ride the Queen’s horses wear purple with gold braid, scarlet sleeves and a black velvet cap with gold fringe – the same colors used by King Edward VII and King George IV when Prince Regent. It’s also the role of the Queen, who first attended Royal Ascot in 1945 and who, prior to this year’s race meeting has owned some 63 Ascot winners including 20 at Royal Ascot, to make a number of presentations to race winners, including the Gold Cup, the Royal Hunt Cup and The Queen’s Vase. 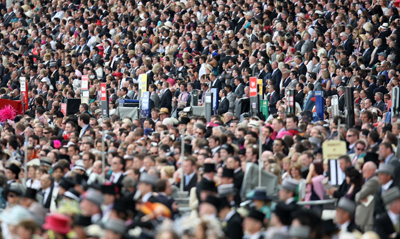 Royal Ascot today is Britain’s most popular race meeting attracting 300,000 spectators and holding the position of the most valuable horserace meeting in Europe with £4.5 million in prize money on offer over 30 races. A key event on Britain’s social calendar, for many Royal Ascot has also become as much about fashion and people-watching as it has the horseracing. 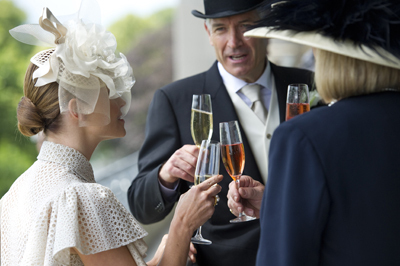 For those who can gain entry – including meeting strict dress code requirements – the Royal Enclosure, which traces its history back to King George IV who first commissioned a two-storey building to be constructed with surrounding lawn for the pleasure of his invited guests, remains the most exclusive of the spectator enclosures at the race meeting. As well as the running of the Diamond Jubilee Stakes (previously known as the Golden Jubilee Stakes), Royal Ascot is also marking the Queen’s Diamond Jubilee with a photographic exhibition, 60 years of Royal Ascot during the reign of Her Majesty The Queen, located beside the pre-Parade Ring. PICTURES: Courtesy of Ascot Racecourse – top and middle: (c) RPM; bottom: (c) Action Images/Scott Heavey.